Hi, I’m Will, the intern on the Developer Relations team. This is the first post in a weekly blog series documenting my experience as a summer intern at Pearson. I am a sophomore Biomedical Engineering major at Stony Brook University, specializing in cellular and molecular engineering. Previously I have volunteered at Genspace, a community biology lab in Brooklyn. One of my main interests is in the connection of biology and technology. For my first few days, after getting that last bit of paperwork finished, I’ve been familiarizing myself with the Pearson products and APIs. Growing up in New York, I’m no stranger to Pearson. Pearson textbooks and online learning software are everywhere. I worked with Pearson’s APIs for the first time at the TechCrunch Disrupt NY hackathon. Me and my father worked as a team to create a winning app using the Kitchen Manager API. After the event, I met Anthony. Fast forward two weeks and I’m interviewing at Pearson. June 30th arrived quickly and then I started work. I am finishing up my first week at Pearson. Probably one of the best parts about working here is having access to the tools that are still in development or not yet released to the general public. The Grid API looks exciting as a next-generation platform for learning. There are some pretty neat things happening in Pearson’s FutureTech department. As an intern, I’m given a lot of responsibility with communication and development. You can find me almost anywhere under the Ueliem handle. On Twitter I’m @willllong, but you might hear from me under the @PearsonAPI account. 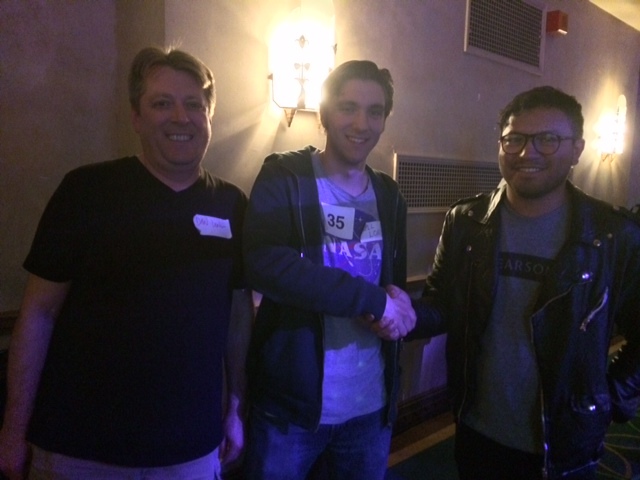 From left to right: my dad, me, and Anthony, now my boss, at TechCrunch Disrupt NY.